The popular term for a group of spots or red, inflamed skin that is usually a symptom of an underlying condition or disorder. Often temporary, a rash is only rarely a sign of a serious problem. Most persons experience rashes at many times in their lives. Rashes are not reportable events. As such, their prevalence is not precisely known. Rashes are common among infants, and most are harmless. Infectious illness: A rash is a symptom of many different kinds of childhood infectious illnesses, including chickenpox and scarlet fever . It may be triggered by other infections, such as Rocky Mountain spotted fever or ringworm. Allergic reactions: One of the most common symptoms of an allergic reaction is an itchy rash. Contact dermatitis is a rash that appears after the skin is exposed to an allergen, such as metal, rubber, some cosmetics or lotions, or some types of plants (e.g. poison ivy ). Drug reactions are another common allergic cause of rash; in this case, a rash is only one of a variety of possible symptoms, including fever , seizures, nausea and vomiting , diarrhea , heartbeat irregularities, and breathing problems. This rash usually appears soon after the first dose of the course of medicine is taken. Autoimmune disorders: Conditions in which the immune system turns on the body itself, such as systemic lupus erythematosus or purpura, often have a characteristic rash. Nutritional disorders: For example, scurvy, a disease caused by a lack of vitamin C, has a rash as one of its symptoms. Cancer : A few types of cancer, such as chronic lymphocytic leukemia, can be the underlying cause of a rash. Rashes are extremely common in infancy. They are usually not serious at all and can be treated at home. Diaper rash is caused by prolonged skin contact with bacteria and the baby's waste products in a damp diaper. This rash has red, spotty sores, and there may be an ammonia smell. In most cases the rash will respond within three days to drying efforts. A diaper rash that does not improve in this time may be a yeast infection requiring prescription medication. A doctor should be consulted if the rash is solid, bright red, causes fever, or the skin develops blisters, boils, or pus. Infants also can get a rash on cheeks and chin caused by contact with food and stomach contents. This rash will come and go, but usually responds to a good cleaning after meals. About one-third of all infants develop acne usually after the third week of life in response to their mothers' hormones before birth. This rash can last a few weeks to a few months. Heat rash is a mass of tiny pink bumps on the back of the neck and upper back caused by blocked sweat glands. The rash usually appears during hot, humid weather, although a baby with a fever can also develop the rash. A baby should be seen by a doctor immediately if the rash appears suddenly and looks purple or blood-colored, looks like a burn, or appears while the infant seems to be sick. An unidentified rash on young boy's back. A doctor or other healthcare provider should be called when a rash that cannot accurately be identified appears or when an identified rash does not disappear in two to three days. A physician can make a diagnosis based on the medical history and the appearance of the rash, where it appears, and any other accompanying symptoms. Treatment of rashes focuses on resolving the underlying disorder and providing relief of the itching that often accompanies them. Soothing lotions or oral anti-histamines can provide some relief, and topical antibiotics may be administered if the person, particularly a child, has caused a secondary infection by scratching. The rash triggered by allergies should disappear as soon as the allergen is removed; drug rashes will fade when the person stops taking the drug causing the allergy. For the treatment of diaper rash, the infant's skin should be exposed to the air as much as possible; ointments are not needed unless the skin is dry and cracked. Experts also recommend switching to cloth diapers and cleaning affected skin with plain water. Most rashes that have an acute cause, such as an infection or an allergic reaction, will disappear as soon as the infection or irritant is removed from the body's system. Rashes that are caused by chronic conditions, such as autoimmune disorders, may remain indefinitely or fade and return periodically. Some rashes can be prevented, depending on the triggering factor. A person known to be allergic to certain drugs or substances should avoid those things in order to prevent a rash. Diaper rash can be prevented by using cloth diapers, keeping the diaper area very clean, changing diapers often, and by breastfeeding. Foods that are known to trigger rashes in persons should be avoided. Parents should monitor the foods that their children eat so that they will be able to identify foods that cause rashes and avoid their consumption. In addition, children who are prone to skin allergies should avoid contact with strong, perfumed soaps; nickel-based jewelry; and irritating fabrics (such as wool). Purpura —A group of disorders characterized by purplish or reddish brown areas of discoloration visible through the skin. These areas of discoloration are caused by bleeding from broken capillaries. Scurvy —A nutritional disorder caused by vitamin C deficiency that is characterized by tiredness, muscle weakness, joint and muscle aches, a rash on the legs, bleeding gums, and skin bruising. Bolognia, Jean L., and Irwin M. Braverman. "Skin Manifestations of Internal Disease." In Harrison's Principles of Internal Medicine , 15th ed. Edited by Eugene Braunwald et al. New York: McGraw-Hill, 2001, pp. 315–30. Darmstadt, Gary L., and Robert Sidbury. "Eczematous Disorders." In Nelson Textbook of Pediatrics , 17th ed. Edited by Richard E. Behrman et al. Philadelphia: Saunders, 2003, pp. 2188–90. ——. "Nutritional Dermatoses." In Nelson Textbook of Pediatrics , 17th ed. Edited by Richard E. Behrman et al. Philadelphia: Saunders, 2003, pp. 2248–50. Lim, Henry M. "Eczemas, Photodermatoses, Papulosquamous (Including Fungal) Diseases, and Figurate Erythemas." In Cecil Textbook of Medicine , 22nd ed. Edited by Lee Goldman et al. Philadelphia: Saunders, 2003, pp. 2458–65. Swerlick, Robert A., and Thomas J. Lawley. "Eczema, Psoriasis, Cutaneous Infections, Acne, and Other Common Skin Disorders." In Harrison's Principles of Internal Medicine , 15th ed. Edited by Eugene Braunwald et al. New York: McGraw-Hill, 2001, pp. 309–14. Ahmed, M., et al. "A peculiar rash and red eye." Postgraduate Medical Journal 80, no. 944 (2004): 370–1. Blackwood, C. L. "Rash and fever in an ill-appearing child." American Family Physician 70, no. 2 (2004): 361–3. 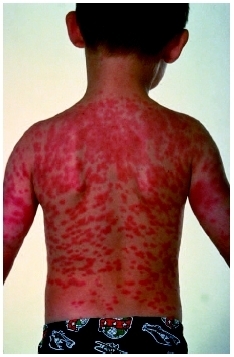 Buccolo, L. S. "Severe rash after dermatitis." Journal of Family Practice 53, no. 8 (2004): 613–5. Healy, C. P., and D. E. Thomas. "Leg rash." American Family Physician 69, no. 10 (2004): 2429–31. Hedberg, C. L., et al. "An infant with generalized rash and abnormal hair." Annals of Allergy, Asthma, and Immunology 92, no. 2 (2004): 210–6. Langran, M., and C. Laird. "Management of allergy, rashes, and itching." Emergency Medicine Journal 21, no. 6 (2004): 728–41. American Academy of Dermatology. 930 N. Meacham Road, PO Box 4014, Schaumburg, IL 60168–4014. Web site: http://www.aad.org/. American Academy of Pediatrics. 141 Northwest Point Blvd., Elk Grove Village, IL 60007–1098. Web site: http://www.aap.org/. American College of Occupational and Environmental Medicine. 55 West Seegers Rd., Arlington Heights, IL 60005. Web site: http://www.acoem.org/. American College of Physicians. 190 N Independence Mall West, Philadelphia, PA 19106–1572. Web site: http://www.acponline.org/. "Drug Rashes." The Merck Manual. Available online at http://www.merck.com/mmhe/sec18/ch203/ch203d.html (accessed December 22, 2004). "Rashes." MedlinePlus. Available online at http://www.nlm.nih.gov/medlineplus/ency/article/003220.htm (accessed December 22, 2004). "Rashes and Skin Allergies." American Academy of Family Physicians Foundation. Available online at http://quickcare.org/skin/rashes.html (accessed December 22, 2004). "Skin Rashes and Other Changes." American Academy of Family Physicians. Available online at http://familydoctor.org/545.xml (accessed December 22, 2004).